The last Christians have fled the northern Iraqi town of Bartella. Six babies were born during the difficult journey east to Erbil, a city under Kurdish control and still known to be safe for Christians. The church group was led to safety by Father Yacoub Saad Shamas who explained what it felt like to leave their homes. According to Father Yacoub, 2000 Christian families from the Syriac Orthodox community fled Bartella on 6 August. Six hundred went north to the Dohuk area, but the majority came to Erbil. Sixty thousand Christians have arrived as refugees in Erbil since Islamic State began terrorising Christians in Mosul and the Ninevah Plains, according to local NGOs. Like so many of the refugees, families from Father Yacoub’s church are spread around Erbil with many settled in Ankawa, one of its suburbs. Some of the refugees are staying with relatives while others are living in schools, church courtyards and public gardens. Up until their exile the Christians from Bartella could provide for themselves. Many owned houses and good agricultural land, which meant food was always available in the markets. But now they are completely dependent on others. The Bartella community has organized itself so that all the families have registered their names with Father Yacoub, who has negotiated to get help from partner NGOs. But he still struggles with distribution: “It is too difficult for us to bring each bag personally to each of the families. We have a good person in the local community whose house we use to distribute the goods,” he said. Distribution of food and supplies in Erbil to refugees from Bartella. 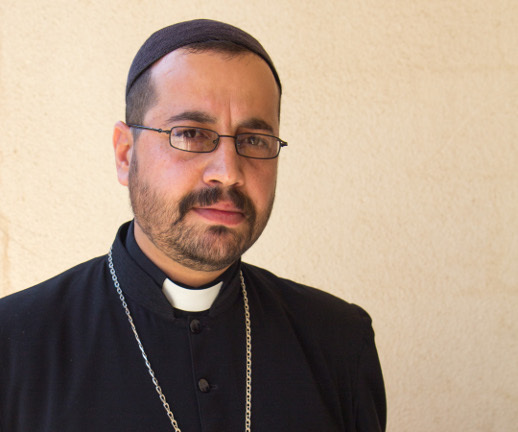 Father Yacoub is a busy man who still has services to take, as the church leader of the community he led to exile. He continues his duty of care for the community. Later in the day he has a funeral service to hold and he tries to visit the different families spread across the city.